While you get lots of space for creativity and experimentation, sometimes you are unsure about what library or framework to choose. The front-end framework you choose can make or break your project in the long run. A quick set of popularity: in just a few years since its inception, many enterprises have added Vue.js to their technical stack. Quick Setup: Vue has built-in data binding and an MVC model (model, view, controller), which makes configuration much easier compared to Angular.js and React.js. Easier integration: the platform supports easier integration with HTML elements. 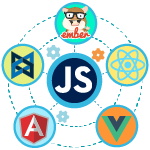 Small learning curve: compared to the Angular JS Framework, Vue is much easier to learn, understand, and use. Few resources: the structure is still too young to find useful solutions on the Internet and self-study. Small community engagement: Vue.js is new to the market and has less community support than Angular and React technologies. Fast, flexible, efficient and lightweight technology: The JS system is widely recommended for its efficiency, small block size, flexibility and a quicker approach to work due to its simple component model and server-side rendering functionality. A transition between versions: migration between versions is usually very simple, Facebook provides “codemods” to automate a huge part of the process. 4. Feels great when working with ES6 / 7 ReactJS, can take on any load. The structure has a component architecture that revolutionized web application development and influenced other technologies. DOM allows you to combine HTML, XHTML or XML documents follow certain criteria, most often into a tree, so React is excellent for web browsers when analyzing various elements of web applications. Big learning curve: Unlike Vue, React takes more time to learn concepts and implement. React JS requires a massive amount of knowledge in how to integrate the user interface into the MVC structure. Lack of streamlined documentation: the super-fast exchange of solutions in ReactJS leaves no room for streamlining the documentation, the documents are placed a bit chaotic, since many developers individually enter them into the database without any systematic approach. Mobile approach to web development. Stable and long-term support for Google. Universal MVVM module, allows you to separately operate in one section of the application, using the same data set. Interdependence of functions, because of their connectedness with components and modules. RXJS, lightning fast compilation, less than 2.9 seconds, modified start HttpClient. Poor optimization: Angular.js based applications require more optimization to solve low-performance problems. Big learning curve: Angular shows a high learning scale, you need more time to master this structure. Integration errors: may occur during the transition from the old version to the new one. Difficult programming language: although Angular uses TypeScript 2.4. Ember Data Library: this is one of the best libraries for API level requests and data retrieval in the local app store. Ember CLI: an idea stolen from Rails, but this feature makes Ember.js very convenient. Many extensions (ember addons) that can be easily added to the application using a single terminal command (ember install). The centralized repository of all add-ons along with the search is also enjoyable. Built-in testing tools: standard ember-cli comes with QUnit. Ember Data: suitable for standard REST API requests only. Many ember addons: ports existing in the jQuery library. Relationship with jQuery: it would be much more convenient if Ember would use axios or a standard sample to create ajax requests. Backbone is an MV* framework. Backbone partly implements an MVC architecture, as Backbone’s View part carries out the responsibilities of the Controller. View: the view part of Backbone apps, Backbone views implement component logic, how model data is rendered to the browser, similar to a Controller in MVC, you can bind views and models so that the view will change whenever model data is altered. Backbone view can use third-party templating engines like Mustache and Underscore.js. Collection: which are just arrays of similar models, if your app has different types of users, each user type will be represented by a separate model, and all user models can be iterated over in Backbone collections. Events: a class that let's implement and use events, both custom, and built-in, and bind various events to Backbone models, collections, routes, and views. Router: an interface that maps URLs to different components of an app, Backbone's router depends on the history object to work with browser history. REST: a simple API that we can use to synchronize the front end and back end more specifically, to request persistent model data and collections from the server. Backbone’s view layer can’t render itself to the DOM: This is where Marionette and Thorax come into, they let make Backbone views to the DOM. Work with Backbone: it’s almost inevitable that also need to learn Marionette, Chaplin, or Thorax.